Most portable DVD players are the flip-top type with a folding screen, but the Xoro HSD 7500 uses a flat 'tablet' construction and a slot- loading disc drive. This saves on space, but it can make the 7-inch LCD screen prone to damage unless you get a good carrying case. Its other big difference is that it comes with an add-on module for receiving Freeview digital television (DTV). Designed in Germany for Chinese brand Xoro, this player feels sturdy despite its relatively low cost. It looks smart and well protected in its black rubbery casing and there's a choice of multimedia sockets for attaching external USB and Memory Stick, SD and MMC card-based memory. You can use these (or CD-R) to play MP3 files, JPEGs or MPEG4 compressed video files including DiVX. The Freeview tuner slots into the left-hand side. If you're running from the mains, it shares the same 12v DC input, making it suitable for using in vehicles. For use on the move there's a clip-on battery pack but that only runs for about 2.5 hours. You lose the external AV in/out and USB port if the DTV module is attached. Set-up is reasonably straightforward but you'll need to change some of the preferences. For example, the DTV module defaults to 4:3 output even though it attaches to a 16:9 screen. We had no luck getting on our test sample's digital text to work, apart from Freeview subtitles (it may work with other countries' digital TV). The digital channels also appear in an arbitrary order, so if you're used to BBC1, 2, ITV, C4 and Five coming first in that sequence, you'll need to customise your channel line-up. While you can navigate Freeview channels with the player's own controls, some DVD cursor functions only work via the remote, which is often unresponsive and is small enough to go missing easily. The player is supposedly multiregional out of the box, though our sample was not, so it's worth checking before you buy that it will definitely play all DVD regions. Freeview is starting to appear in portable devices, but its reception can be patchy even with a full-sized rooftop aerial, so small antennas such as the one supplied with the Xoro can't really pick up a good signal at present. If you're using this as a desktop TV/DVD in a home office and you can plug in a proper aerial, it should work fine. If you're on the road, you might get little or nothing on Freeview unless you're on holiday in the first switchover area of Cumbria circa 2008. Sadly there's no analogue TV tuner as a backup, so this device is a DVD player first and foremost. We also had trouble getting the USB port to function, though the card reader accepted various AV formats. The picture isn't too bad overall. Screen quality is respectable, with a wide enough viewing angle for two people side by side. However, there's some visible line structure compared to, say, Sony's PSP, so it's not rapier-sharp, and the colour is slightly muted too. Dark films, such as Harry Potter and the Goblet of Fire, look rather too murky here. Brighter films, such as Peter Jackson's King Kong, fare better but reveal intermittent video noise. 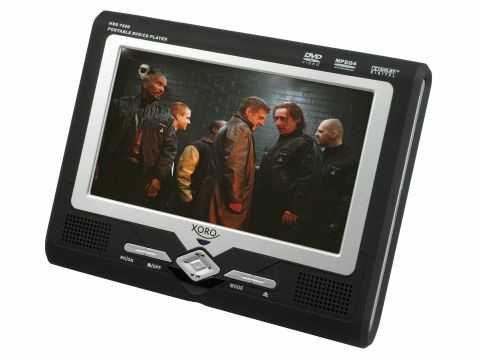 The connection between the Freeview tuner and the LCD is only through the same basic composite video input available for other external sources, so the Xoro's picture quality is better with DVD than Freeview. Similarly, the DVD video output is only composite, so if you use it to watch discs on a full-sized TV, you won't see the kind of quality that players with component, RGB or S-video can deliver.